The National Party was formed in 1936 by the merger of the two main conservative parties of the time. The electoral politics of the 20th century were dominated by two parties – National and Labour. By 2017 National had held office in New Zealand for more years than any other party. The National Party was set up in 1936, when the two main conservative parties, Reform and United, merged. The two parties had campaigned together as the National Political Federation in the 1935 election, but Labour won in a landslide. Sidney Holland led National to win for the first time, in the 1949 election. He believed in individual freedom and responsibility, and was tough on watersiders during the 1951 waterfront labour dispute. Holland was replaced by Keith Holyoake in 1957. Labour won in 1957, but National then won four elections in a row. National was in power through the 1960s. It was a decade of rising prosperity for most New Zealanders, but from 1965 there were also protests – for women’s rights and the environment, and against the Vietnam War. In 1974 Robert Muldoon became National’s leader, and prime minister the following year. He was popular at first, but was later in conflict with both liberals and conservatives. His government regulated the economy strongly. When National MP Marilyn Waring decided to vote for Labour’s nuclear-free legislation in 1984, Muldoon called a snap election – which Labour won in a landslide. National, led by Jim Bolger, won the election in 1990. Bolger’s government continued the economic reforms of the previous Labour government. They cut welfare benefits, and passed laws to make union membership voluntary. In 1996 MMP (mixed-member proportional representation) was introduced, and National formed a coalition government with the New Zealand First party. Bolger was ousted as leader by Jenny Shipley, the first woman prime minister. However, the next three elections resulted in Labour-led governments. In 2008 John Key led National to victory, forming a coalition government with the Māori Party, ACT and UnitedFuture. Bill English succeeded Key as prime minister and party leader in 2016, but National lost power after the 2017 ekection. In the early 1970s National had about 200,000 members, from many different parts of society. However, party membership then declined. National’s party organisation, which is separate from its parliamentary section, holds an annual conference to elect its governing board, hear from senior MPs and, in closed sessions, have some general policy discussions. While some Māori leaders have been involved with National, the party has never had broad support among Māori. 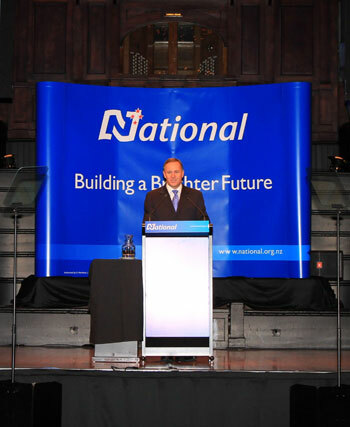 However, National was in coalition with the Māori Party after the 2008 election.